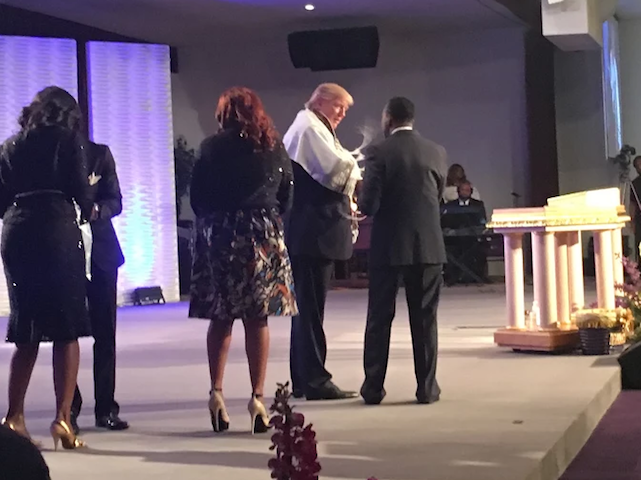 Trump’s speech on the podium came after he taped an interview with Bishop Wayne Jackson, who along with his wife Dr. Beverly Jackson, serve as the senior pastors for the inner city Detroit church. The interview will air next week. 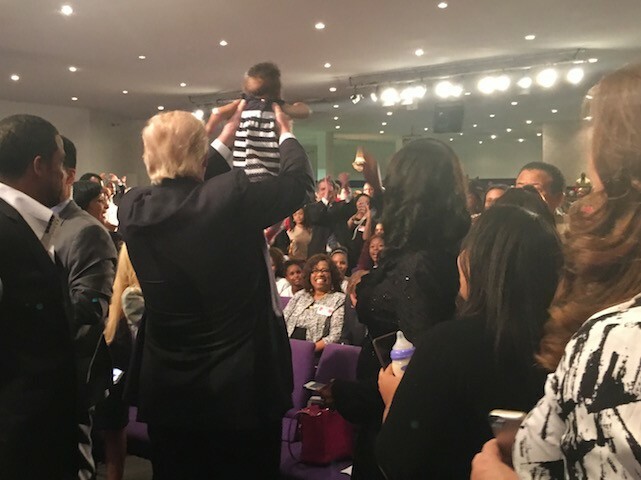 After the interview, before Trump’s speech, he sat in the front row of the church’s pews for the opening of the Saturday service—and even danced along a little bit with the black leaders as the service opened up with a few upbeat songs. 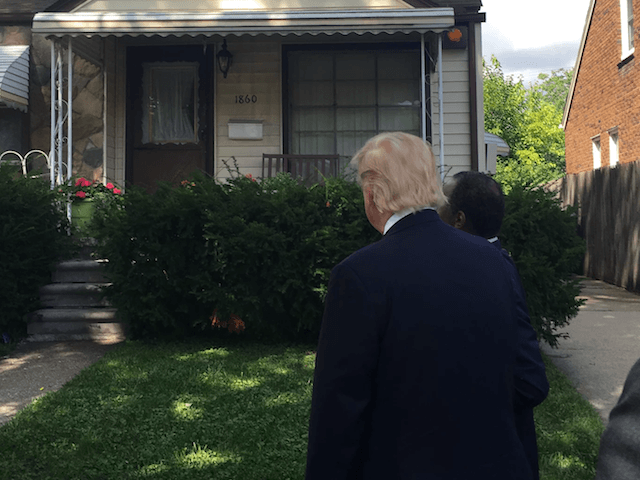 Later in the day, with Carson as his guide, Trump visited Carson’s boyhood home in Detroit–walking down Carson’s street talking to the people there, many of whom seemed supportive of what Trump is doing. 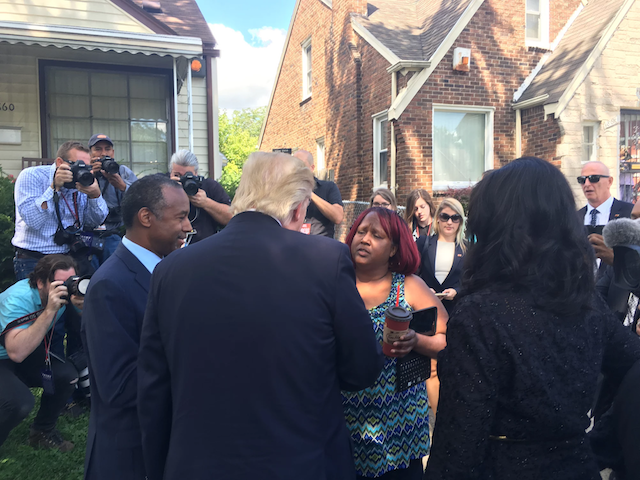 Carson and Trump talk to Carson’s boyhood home’s current homeowner. 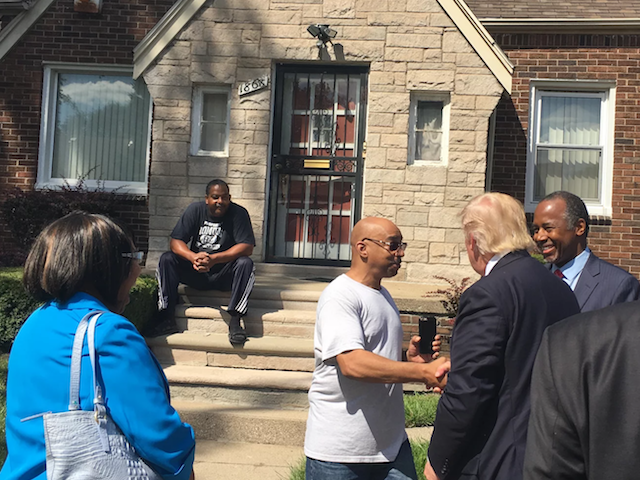 Carson and Trump talk to the neighbors too as they stroll through the world renowned neurosurgeon’s old stomping grounds. Trump has already successfully defined himself as a candidate of change, while his opponent Hillary Clinton represents the status quo. In this Detroit event, however, aides to Trump note he took a different tact: His new aim, in addition to representing change, is to begin representing “hope”—and a positive outlook for the United States with an uplifting policy agenda designed to fix problems for everyone in the country. The themes of “hope” and “change” are strong in the American electorate, and it’s those two promises that propelled Barack Obama—America’s sitting two-term president—into the White House in 2008. Many, whether they like Obama or not, do not believe he has delivered on the promises he made of hope and change. Many believe he has failed, and has become one of the most divisive presidents along party lines in history, alienating millions of Americans who don’t support his agenda. “He gave a positive uplifting speech and delivered a strong policy agenda for economic growth, education, and prosperity for communities that have suffered under insider politicians,” Pierson said. 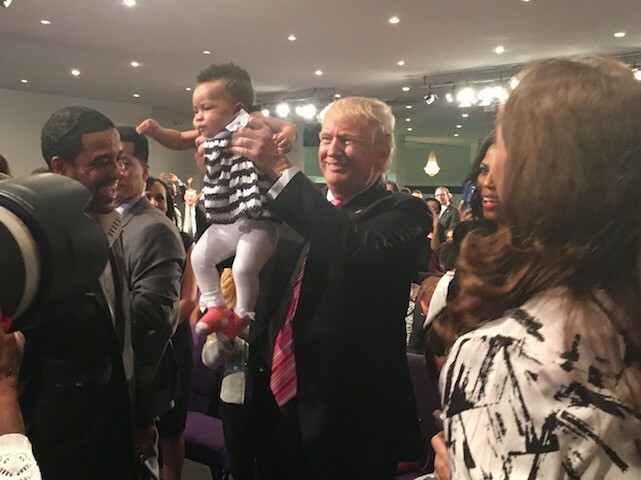 In the event, Omarosa, the former Apprentice contestant, noted, “the spirit was so high.” At one point, Trump even held up and kissed a baby. 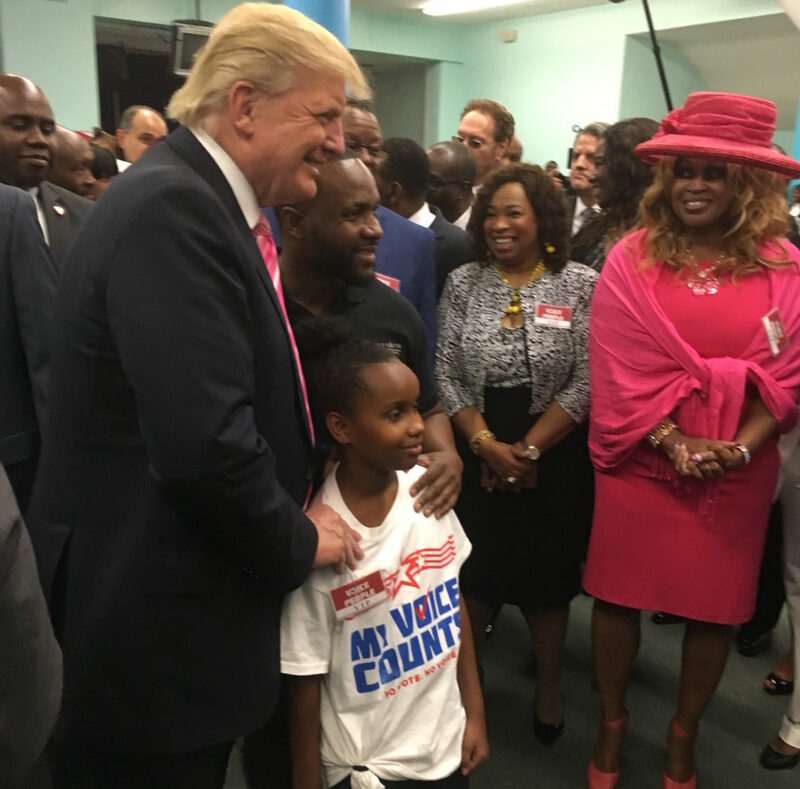 Omarosa, who’s also now a pastor as Trump noted in his speech, said Trump is clearly gaining support in the black community. 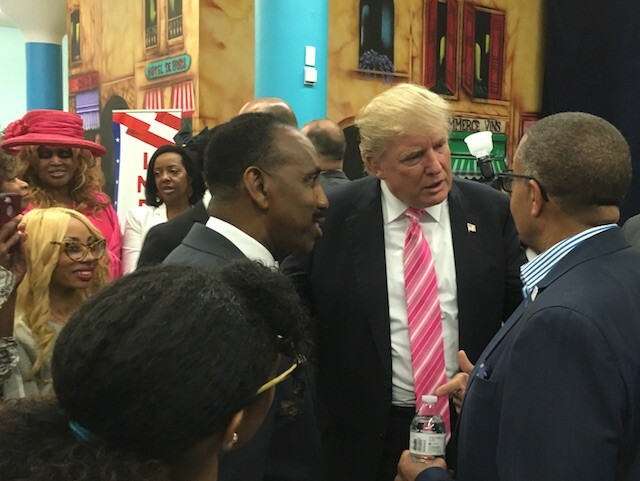 Carson, Trump’s former rival in the primaries turned strong supporter, advised him on the way here on messaging and tone, and the results of the advice Trump is taking not just from Carson but others in his inner circle including Sen. Jeff Sessions (R-AL), former New York City mayor Rudy Giuliani, his running mate Indiana Gov. Mike Pence and more, is showing up in the analytics. 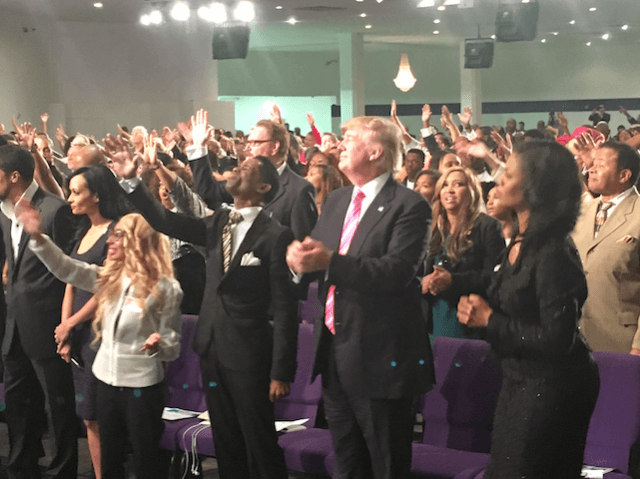 Carson told Breitbart News that Trump is gaining support in the black community. Indeed, during his speech, Trump made a reference back to the fact that the party that nominated him for president—the Republican Party—freed the slaves under President Abraham Lincoln, who was a Republican. Republicans have led the way on Civil Rights for more than a century, championing the civil rights reforms of the 20th Century, and have led the way on women’s rights as well. Trump has, in previous interviews with Breitbart News, expressed how proud he is to carry on this Republican tradition of leading on civil and women’s rights while Democrats choose to not only not lead, but in many cases work on the other side. In this speech—in the aforementioned policy specifics—Trump laid out how he plans to lead on the 21st Century’s civil rights agenda, an agenda focused on jobs, education and opportunity for all. Just like with previous civil rights movements, Democrats—who have nearly unanimously ruled America’s inner cities for decades, in some cases more than half a century, driving their economies into the ground—are on the other side of the civil rights agenda. In addition to Scott’s statement, the Trump campaign detailed the policy specifics in a press release designed to address each of the “civil rights agenda” items and more. It’s because of these efforts that Lynne Patton, a black woman executive who has worked for the Trumps in various capacities for years, was so proud of her boss in Detroit on Saturday. Patton became a surprise star at the Republican National Convention in Cleveland in July, where she delivered a sizzling speech about how Donald Trump and his family care about everyone—a speech that came after a video she crafted detailing how Trump’s companies have hired more minority and women executives than any other she’s worked at. 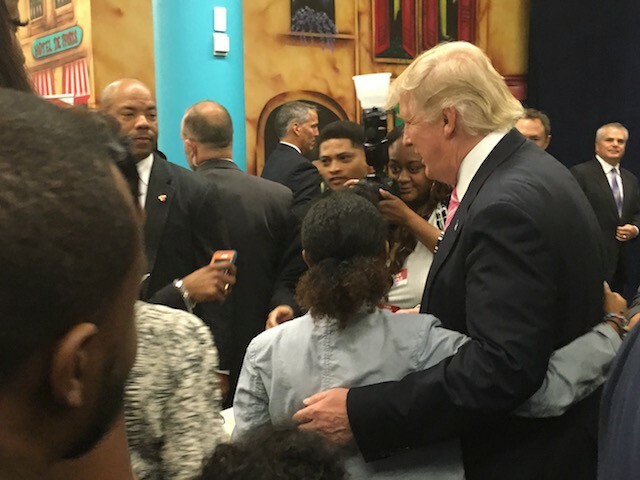 What Patton, Omarosa and so many others who have worked with Trump over the years suggest is that the real estate magnate has always cared about the black community; and that he wasn’t attacked by Democrats on racial lines until he ran for president as a Republican. 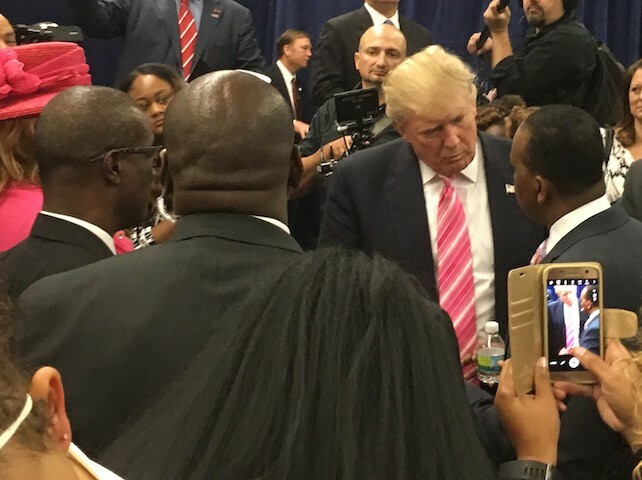 Trump, despite the mainstream media narrative to the contrary, has a long and deep history of breaking racial barriers and working African American leaders on issues of equality and civil rights. Tonight, as we stand in the shadow of one of the darkest months in modern American history I know now more than ever that Donald Trump is the law and order leader we need to heal a wounded and divided nation. We all watched, horrified and helpless, as a radical Islamic terrorist targeted members of the LGBTQ community in Orlando. 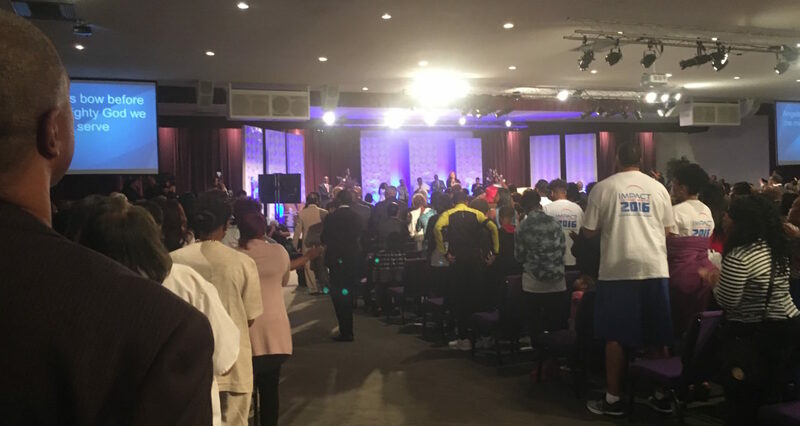 We’ve seen discord in our urban communities sparked by the senseless deaths of young black men in Baton Rouge, in Minnesota, and far too many places around this country. We watched in horror as our nation’s finest were gunned down in Dallas and Baton Rouge as they sought to protect the very people protesting them. But in order to heal as a nation, we must stop viewing these incidents as attacks on the LGBTQ community or attacks on the black community or even attacks on the law enforcement community. They are attacks on America, they are attacks on our values, they are attacks on the very foundation of civil society. Sadly, there is not one person in this room who can deny that historically black lives have mattered less. My life mattered less, and whether we like it or not, there are people out there who still believe this to be true. But tonight, as a minority myself, I personally pledge to you that Donald Trump knows that your life matters, he knows that my life matters, he knows that LGBTQ lives matter, he knows that veterans lives matter, and he knows that blue lives matter. This country is sadly more divided than it was eight years ago. But tonight, don’t hope for change: Be the change. To wrap it all up, it wouldn’t have been a complete day if Trump didn’t thank the law enforcement community in Michigan for everything they do. 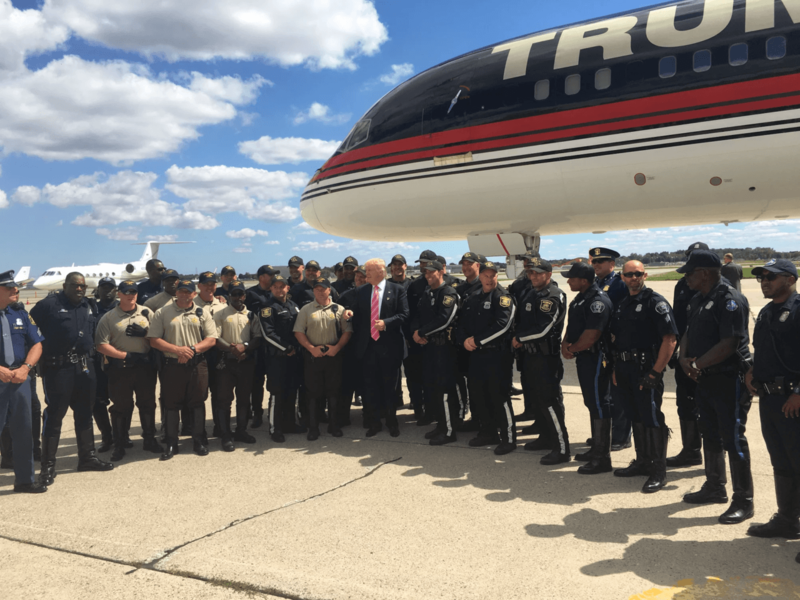 Back at his plane before heading back to New York City, Trump took individual photos with many of the officers who were part of his security detail during the Detroit trip–and a group photo with all of them.